Charitably listed as a “comedy” on IMDb, the laughs are always unintentional in the horrific, From Justin to Kelly. And the synopsis is thus: “A waitress from Texas and a college student from Pennsylvania (‘the Pennsylvania Posse’, a group that includes the fro-ed Justin Guarini) meet during spring break in Fort Lauderdale, Florida and come together through their shared love of singing.” They certainly don’t come together in any other sense as this thing is TAME TAME TAME. The occasional beer is quaffed (not nearly as many as we’d regularly consume during a podcast recording) and an endless array of set pieces prevent Justin (Guarini) from finally meeting up with Kelly (Clarkson). And no fireworks can be had. Not the barest of sprinkles, or the faintest of explosions. So why this musical? 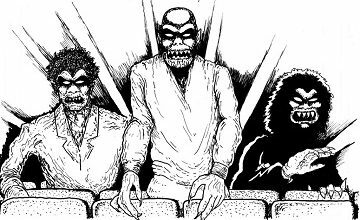 We actually like musicals, and have discussed several on the Really Awful Movies Podcast, a program devoted to genre cinema. If you’re a fan of American Idol or The Voice, you’ll know that while the latter consistently struggles with “putting over” (to use a WWE term) its talent, American Idol has actually produced a few bona fide stars. Kelly Clarkson is one of them, a pop culture supernova immortalized in the 40-Year-Old Virgin. Justin Guarini, is not one of them. So it’s interesting to see where their careers headed after this shameless cash grab. So, sit back, take a listen to a few of the tunes, and of course…WATCH THE MOVIE FIRST and join us for a discussion of…From Justin to Kelly. And subscribe too. Elvis Presley. The King of Rock ‘n’ Roll. 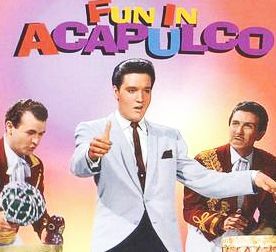 Here he is, or was, at near the peak of his powers (or just about to level off) in one of the many, many terrible movies he appeared in, FUN IN ACAPULCO. The massive pop culture icon plays Mike, a former member of a flying trapeze circus act, who finds himself lost in…Acapulco, and needing to find work to make ends meet. He gets connected with a little kid, who becomes his manager, landing him singing gigs at all the best hotels/clubs in the Mexican town, usually accompanied by horrible mariachi singers. Along the way, there are a couple of love interests (one of whom is played by Bond babe, Ursella Andress) and of course, a fierce (well, not really) rivalry between gringo Mike and a competitive cliff diver (again…once you’ve seen one mano a mano tilt between a lounge singer and a competitive cliff diver, you’ve pretty much seen ’em all). So thank you for listening…and…thank you…thank you very much.